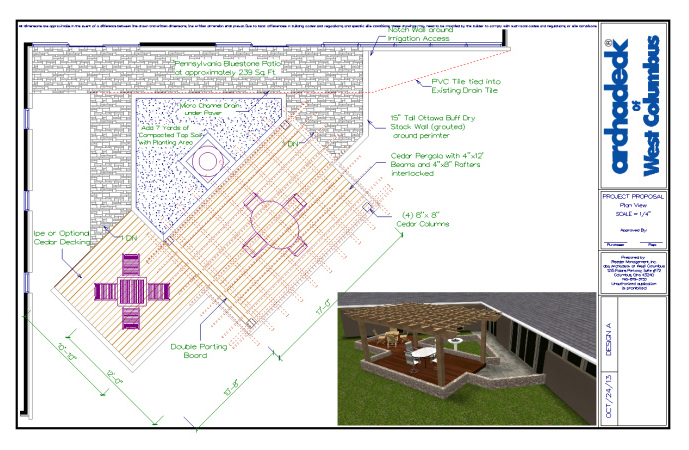 A peek into our upcoming outdoor living combination project in Dublin, OH. Our first upcoming project preview is located in Dublin, OH very close to the zoo. These homeowners had no existing outdoor living space and contacted Archadeck of Columbus to create a low-maintenance deck and covered porch to enliven their backyard enjoyment. The design includes a multi-level deck, open porch and extensive hardscape skirting. Dublin, OH deck and open porch plan. This large multi-level deck is being built with low-maintenance TimberTech Earthwood Evolutions Terrain decking in Brown Oak. The stair treads and rail cap will be built using TimberTech Earthwood Evolutions in Tropical Walnut. The two neutral shades play off one another and add visual interest to the decking components in this project. Tan vinyl railings with round powder coated black balusters will finish off the details of this elegant deck which steps out on three different sides to lower levels. The deck itself encompasses an area of 1440 square feet. 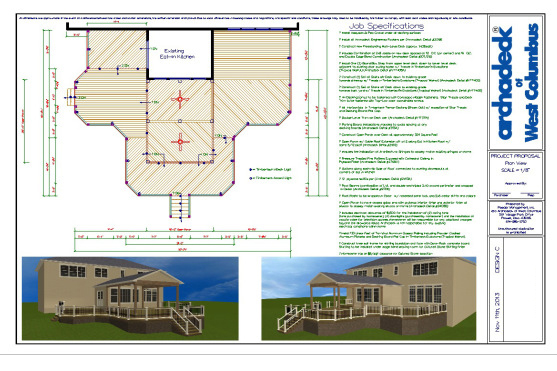 The large deck balances the long rectangular porch that will set in the middle of the space within its own level. This deck and open porch combination promises pure outdoor living bliss! The open porch adds an air of charm to the outdoor living combination because it is reminiscent of the classic design of porches from another era. The porch is placed around the home’s existing bay window and will look original to the home once completed. The placement and design details make the porch appear as if it has always been there. The porch will have pressure treated pine rafters all wrapped in cedar. The six columns included in the design will have a recessed panel on the columns with each having skirts and collars. The ceiling will be finished in ply bead to further the country feel of the space. Finishing up the porch will be two ceiling fans, four down lights and for added enjoyment the interior will have speakers wired to all four corners. Adding sound to this already stunning outdoor oasis will enhance entertaining opportunities for these Dublin homeowners. Since this backyard has a large amount of slope, the skirting including on this project is dramatic. At the lowest point the structure sits 6″ above ground and spans to 5′ in some parts. The skirting is being completed using cultured stone to match the front of the home. The cultured stone runs the entire perimeter of the backyard structure and encompasses 140 linear feet. Here is a first look at this Arlington, OH outdoor living combination. 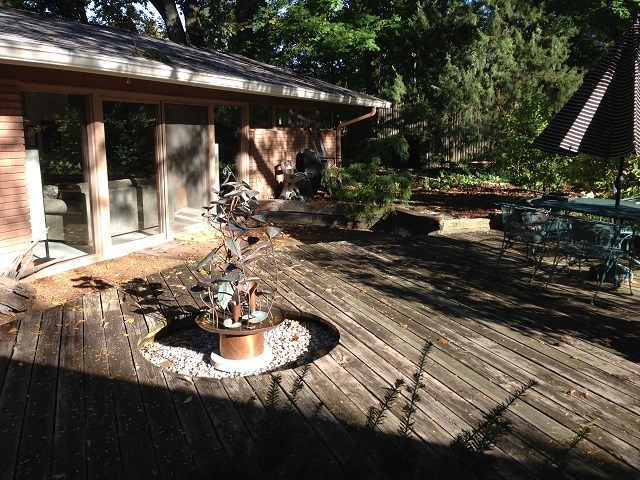 Our second upcoming project takes us to Upper Arlington, OH where the homeowners have a very old existing cedar deck that is just one step off of the ground. When the homeowner’s contacted us, their existing outdoor living space did not do the home or the surrounding landscape justice. Many times with aging decks of this nature, where time and weather have taken their toll, it is better to just clear the area and begin afresh. That is exactly what Archadeck of Columbus has in mind. This image shows the space before we begin the project. We are starting this backyard transformation by removing the old deck and railroad ties to make way for an Ipe deck and large pergola which connects the home to the deck space by way of a stunning natural Bluestone patio. 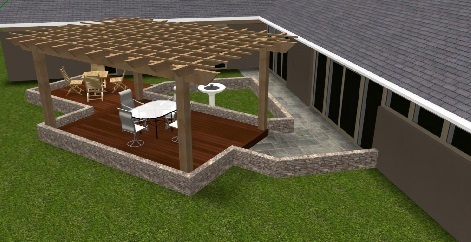 The space will include an Ipe Brazilian hardwood deck which is covered with a large cedar pergola. The pergola is designed to include large structural elements including large beams and joists. The use of larger elements will give the pergola a “beefier” feel a really make a design statement as part of this outdoor living combination. From the deck we are building limestone walls that lead to the rear door of the existing home. The limestone walls are to be 6-inches wide and will harmonize beautifully with the wood used in the deck and pergola. Natural stone compliments wood when used together, and creates a space full of rustic natural elements. As part of this project we will have to contend with some existing irrigation and electrical which will require retro-fitting a lot of new wiring and irrigation lines. Upcoming Arlington,OH outdoor living combination. As you can see, the shape of things to come is an outdoor space that combines multiple functions with multiple elements. Designing the perfect outdoor space for you and staying on top of outdoor living and design trends is our business. We are seeing an increase in the number of combination projects Columbus area homeowners are seeking such as deck/porch combinations and deck/patio and pergola combination. Clients who build combination projects want to create an outdoor space that fits all their needs, and allows the effortless flow from one structure into another to offer maximum enjoyment in their backyards. See more multifaceted outdoor combination structures by visiting our many photo galleries, located on our website. There are so many wonderful and functional combinations it will be hard for you to choose! Next Next post: Please, please start planning your spring outdoor living addition project now!